While the physical card game doesn’t have a creature limit, because there’s such a limited amount of space on screen and I don’t want to do scroll bars, I made a 5 creature limit per player and 10 card hand limit for the digital version. The problem is there are abilities that move creatures to your side. The 2 solutions would be to do nothing or destroy the card instead of moving it over when the limit is already reached. I ended up going with destroy since doing nothing would hurt players more for their ‘mistake’ and it goes more in line with what the player wants to do. I started testing with a spell that moved a creature to your hand… to then realize the limit will never be exceeded because you lose a card first by playing the spell. The screenshot shows the next test. 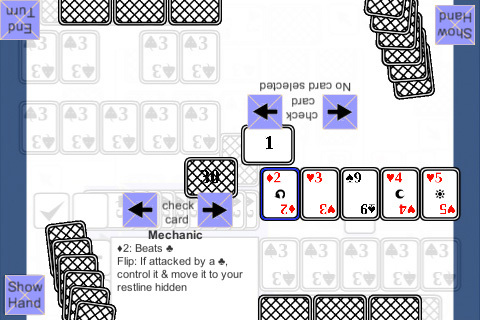 The highlighted card moves an enemy to your side. The screenshot shows the graveyard count at 1 rather than the creature moving to your side because the player already has 5 creatures on board. What’s next: applying this same mechanic to the rest of the cards that need it.